I've Got A Feeling ("Everybody had a good year"...etc.) ? Although it's not a Beatles song, how about Bowie's Let's Dance, @Beatlebug? I did think of that too, @SgtPeppersBulldog, among other Bowie tunes up for consideration (he's a David Bowie fan and part of the reason I got into Bowie myself). It's a bit long, but I guess we wouldn't play all seven minutes. Edit: We also thought 'Changes' would be good. Oh look at Maggie Mae , she's a graduate today! And she'll never turn in homework anymore. Oh look at graduating Maggie Mae ! The Magical Mystery Tour of life is waiting to take him away. @Ahhh Girl: Great minds think alike! I posted MMT earlier. @Beatlebug: How about Maxwell's Silver Hammer ? Is your friend going to uni or college to major in medicine? Has anyone heard from/about @Necko? I may have missed an announcement explaining his absence. Earlier, I went out to grab some breakfast sandwiches for Zag & I. While waiting in line to pay, I found myself between 2 distinctly different people. The gentleman behind me was dressed to the nines - shirt, tie, jacket, etc... The gentleman in front of me was wearing flip flops and a bathrobe, no etc... I kid you not. How about Maxwell's Silver Hammer ? Is your friend going to uni or college to major in medicine? I think we've just about decided we'll play 'With A Little Help From My Friends ', but thanks all for the suggestions! I got some good laughs. I was thinking about that, too. I don't recall hearing anything from him about it. I hope he's ok; I didn't get the impression that he was a very disappear-y type. I dunno where was it taken or if some of you might have seen it already. Anyway i think it's pretty cool. I actually shared this on social media yesterday. I figured it would already be on here somewhere. My computer at work is running at the pace of *snail*. Your bees must be enjoying all the pollen...wait, wrong thread. 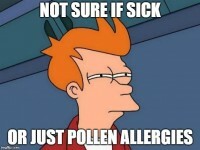 Not that kind of pollen. Speaking of snails, the weathers turning to autumn here and we've had some rain, so of course a million tiny black centipedes come crawling under the front door to climb up the wall, I've no idea why they do it. I sweep a bunch back out but its like watching lemmings or something. They don't go anywhere after trying to climb the wall they just die. Maybe its the centipede mating season and my flat is in the way. Let meet at @ewe2's. Party!!!! Have you tried feeding the critters?